My tryst with Himalayas started when I first explored one of the most remote regions in India Ladakh two years ago and since then I could not imagine adventure travel anywhere except the Himalayas. So when I came upon a tough trek to the region of Roopkund situated amidst the mighty Himalayas in Uttarakhand, a mountainous state in India, I signed up for it immediately. 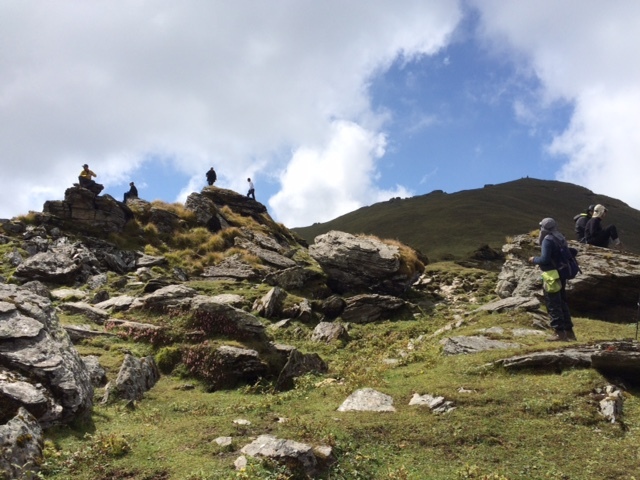 Roopkund has it’s fair share of legends. A tiny lake inside a glacier and hundreds of bones and skulls that dates back to 2,000 years ago it remains a mystery. Scientists are still trying to figure out as to how these remains came about at an altitude of 16,000 feet. Meeting my friends at Delhi Railway station, we took an overnight train to Kathgodam – a hill station followed by a 10 hour long rough road ride to the base camp Lohajung. We were set to start our first day of the trek the next morning. I remember the first day was touted to be a tough trail and tough it was! Very steep ascents and I was huffing and panting away. Just as I was about to give up the body started adjusting to the trek. 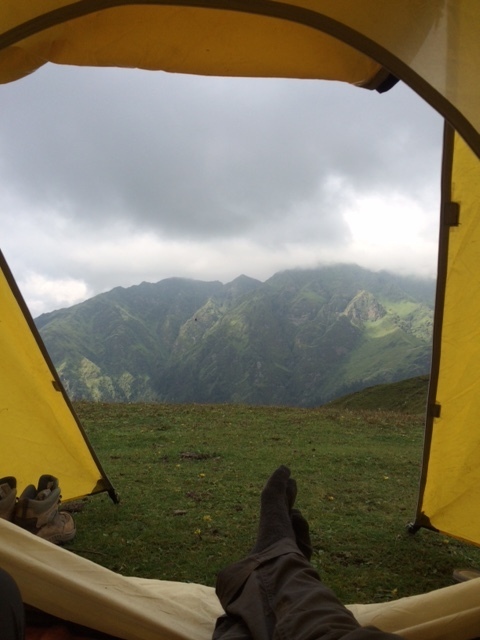 The scenes unfolded around me as I took in the massive Himalayan Ranges surrounding us. Each scene was ever changing and refreshing. Following the rules of a trekker, I took small steps, paced myself and started enjoying the journey. I was sometimes walking alone, sometimes with friends and making new friendships, the trek became more interesting meeting new people in this beautiful environment. 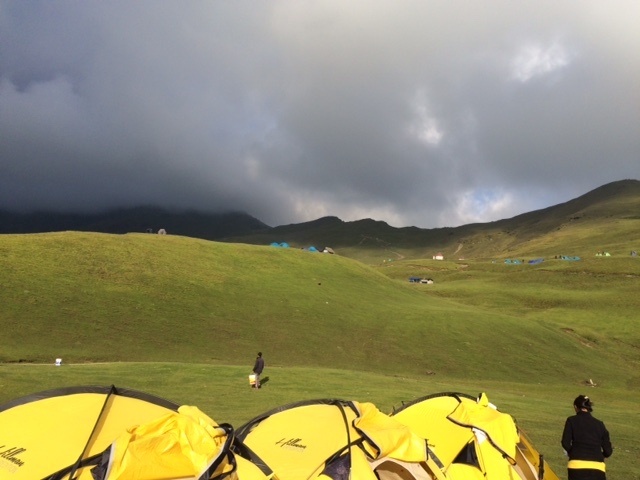 We reached the first campsite at 8,000 feet which was the starting point of the forest and we could get a glimpse of Nanda Gunti – A magnificent Mountain range that would follow us through the trek. The next morning when we set out for our next campsite, we had to trek through the forest. We were strictly warned by our Guide that no matter what we had to be in line and follow each other. As I looked down below, I saw the steep valley. It seemed endless with steep ascents and narrow paths until we reached Picture Perfect Meadows. Whatever tiredness and fatigue I felt after trekking for a whole day vanished seeing the meadows. It was beautiful as we relaxed for some time with my friend playing songs of The Beatles. Finally we reached the most beautiful campsite. It was set up in rolling meadows called Bugyals in local language. It felt surreal. The next two days were spent at the campsite. We saw the proud and loyal Mountain dogs guarding the sheep grazing on the meadows, the tinkling sound of cow bells and local people doing their daily chores. We had left behind our daily responsibilities, burdens and baggage to being truly free and in the moment. Sunsets, Silence, watching the Milky Way at night with the stars guiding us than artificial lights, it was bliss. The next day was a tough ascent to the next campsite. As the altitude increased so did our breathlessness and body aches. With the wet dew on the grass, one had to tread carefully. We would be climbing only further up from here and there was no going back. The terrain changed drastically within an hour. From green meadows, the whole landscape became rugged and rocky. There was no tree in sight. At the next campsite, we could see we were getting closer to our destination. What a sight it was waking up to a magnificent Vista of the Mountains in different colours, one got the feeling that one could reach and touch it! With a wind chill of -3 degrees and high windy weather we set out to the final Campsite. We had to trek on a near vertical ascent with dangerous Zig Zag turns. The landscape surprised us again with it’s weather. Walking through a haze of fog, slight drizzle, I felt we were reaching the clouds. We were at 14,400 feet now. The next day, we set out as early as 5.45 am for the final summit to Roopkund. The 3.5 kilometre steep ascent to the summit was pretty rough with ice and slippery rocks. Using trekking poles and pushing away my fear of heights, me and my friends encouraged, motivated each other to look and walk ahead. At one point, I panicked and stopped but thanks to my able guide, I moved on from that fear. As we looked up and finally reached the small ridge, there it was, ROOPKUND SUMMIT at 16,000 feet! A small lake that looked smaller because of a recent landslide with hundreds of skulls and bones around it. The exhilaration I felt upon reaching the summit was beyond words. My fear of heights was always there but I could do it without giving into my fear with the support of my friends and guide. I had conquered my inner fear, obstacles I built up inside me, I felt thankful and humbled at the same time. One thing was certain, my perception had changed and my life would never be the same again. Swapna is a cafe owner from Hyderabad, India. She is a writer, blogger and enjoys trekking in the Himalayas and Yoga. An epicurean at heart, a voracious reader and seeks the extraordinary in ordinary things of life.